For this weeks challenge we should tangle around a photo. 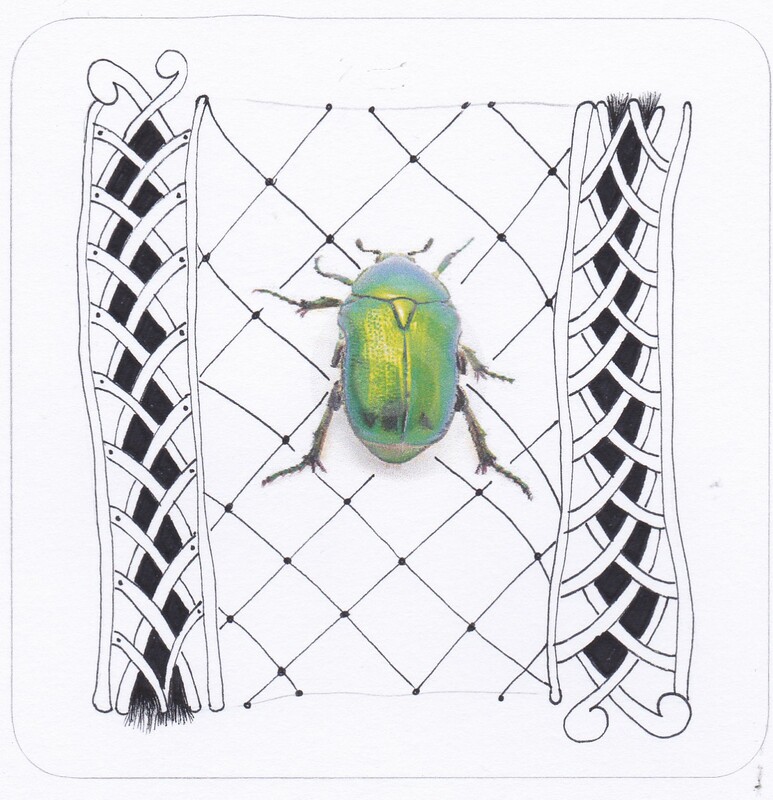 I printed a photo of a beetle on drawingpaper and cutted it into a tile. Tangled it with on both sides the new tangle "Chaist"
Chaist was designed by one of my friends Yvette. Here 's how to tangle Chaist. And the tile for the challenge. What a lovely frame for a beautiful photo. Gorgeous beetle! and quite a neat tangle! Thank you for the beautiful new tangle. Your beautiful beetle tile is simple but so effective. What a fun tangle. Like a zipper! I love how you used it with the challenge! Wat mooi gedaan Mariët! Leuk, die kever en ook een leuke nieuwe tangle. Dank je. I had one of those beautiful beetles flying around in my garden yesterday, great choice of picture. And the net with chaist goes very well with it. Chaist is a wonderful way to frame your beetle! Jean is right.... it looks like a zipper! I like this new pattern. Looking forward to trying it. Oh I like the new pattern, thank you for introducing us! I love the colors on your beetle, and you tangling is simple and elegant and sets it off wonderfully.